Imagine if all poverty and need were forced into the shadows based on the perceptions of danger by imaginative wealthy people. We would have what we have now; housing built predominantly for the well-off, with so little housing for the poor that the rest of us huddle under overpasses. Most cancellations are motivated by public outrage over the Trump administration’s “zero tolerance,” under which every migrant crossing the border without papers is criminally charged and held in detention centers. Over 3,000 children have been torn from their parents and thousands of others have been incarcerated. I’d had an “inappropriate outburst.” I’d been restrained, and then the device was used on me. It was designed to shut down the errant part of my brain by using a magnetic pulse. I was uncertain of whether the memory was real, or if it could have been a nightmare. How can we be housed and sleep at night/ when our brothers have no homes?/ How can we be housed and sleep at night/ when our sisters sleep on stones?/ What happened to the home we shared inside God’s heart?/ Whatever drove that home to vacancy drove us apart. Youth Spirit Artworks is anchoring the campaign and is the new non-profit sponsor of Street Spirit. You can donate via PayPal, credit card or check. Checks can be sent to: Youth Spirit Artworks—Street Spirit Newspaper, 1740 Alcatraz Ave, Berkeley, CA 94703. Learn more about Street Spirit's unprecedented collaboration with the independent film Dogtown Redemption in the video above. This year, Street Spirit turned twenty-one years old. To celebrate, we are launching our new podcast series with an interview with co-founder Terry Messman about the history of Street Spirit’s advocacy journalism. Street Spirit interviews with inspiring leaders and organizers of nonviolent movements for peace and economic justice. 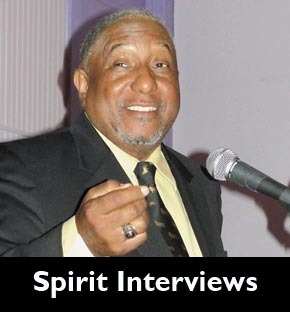 You can view over 400 articles in the Street Spirit archives by Date and by Category. Please be advised that there are two rotating stories in the photo box at the top of this page. To get from one of these two articles to the next, simply click on the arrows at the bottom left or right. To view an article in its entirety click on the story's headline. Rev. Barber told the activists gathered in the nation’s capital that by demonstrating in solidarity with poor people, they had become a link in the long history of people who fought for justice. As homelessness becomes more visible, people living on the streets are targeted for bullying, assaults, harassment and even murders. We will never know how many huge pots of soup Jacob lifted with the sisters into trucks, to take to the homeless in the park. We will never know how many diseased bodies he fed, held and bathed, and the number of tears he dried in the early morning hours. She took home with her the men who had only a few days left to live and were suffering the most, and tenderly cared for them around the clock. I am certain some of the people I was meeting were angels, whose job was to make certain no soul died alone and unloved. She softly sings the soul anthem “Stand By Me.” It is a song for Miss Kay, a song for all of us. Her life, with its music and joy, followed by a downward slide into homelessness and death, tells us something deeper than words about the human condition.